introduce topics in your Turning Point small groups so that participants will have increased awareness about life's issues and the power of Christ. illustrate lessons and sermons with personal stories and drama. help people you counsel understand the dynamics of life-controlling problems. The vignette clips vary in time from twenty seconds to six minutes. With DVD you can go to the exact vignette you want to view without having to guess where the next clip begins. The power of a personal story of God's grace can be a breakthrough in the life of a hurting person. 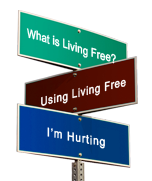 This Living Free resource will is an effective tool to use when ministering to those with life controlling problems.